You know what? I realized that I haven’t featured a sight from the beautiful province of Bohol yet! So let’s rectify this deplorable situation by featuring Panglao Island, specifically the Panglao Island Nature Resort and Spa. Panglao Island is said to be the next Boracay and already there are plenty of resorts stationed there. Aside from Panglao Island Resort, there’s Alona Palm Beach and Bohol Beach Club. But unlike those two which are found on the southeast coast of the island, Panglao Island Nature Resort is on the northwestern side and thus has views of the sunset, which I like very much. Photo from the resort website. I could write about the amenities of Panglao Island Resort but their official website would be better at it. Besides, in terms of amenities, you can expect pretty much the standard fare found in many other beach resorts, including an infinity pool. Although, come to think of it, Panglao Island Resort does have this nifty man-made island which provides a nice base for snorkeling. You can see this island as a small white patch of land about 100 meters directly north of the pool in the satellite imagery. The imagery is also a bit outdated since I could not find the rectangular second pool that can be seen on the resort’s website’s gallery section. 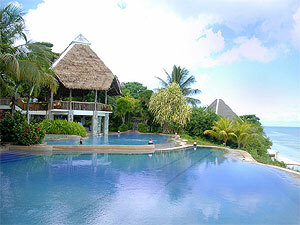 The infinity pool in Panglao Island Nature is amazing!